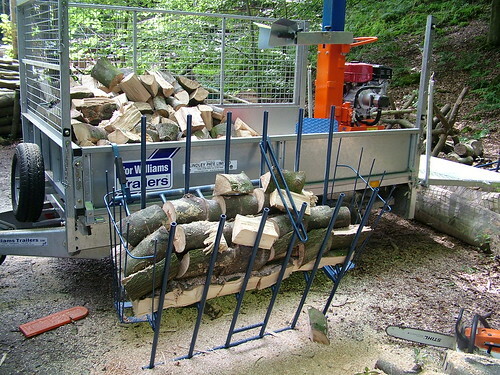 Made a trailer load of logs today using the new splitter and the excellent Buckingham woodstation. And then load the trailer, notice there are NO LOGS ON THE FLOOR! 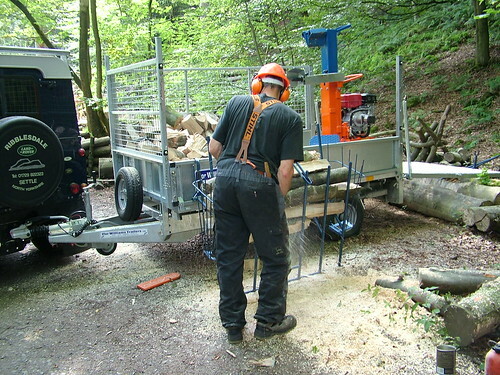 (OK then, just an odd one) Brilliant, every logger should have one. 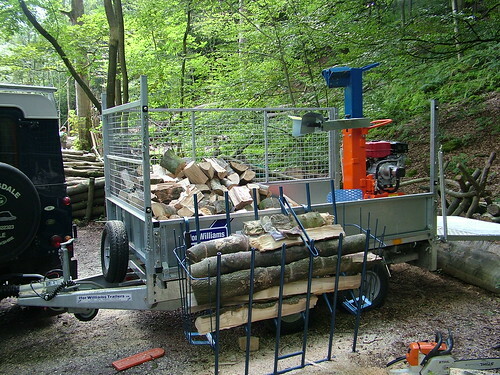 The trailer is loaded by lifting up the front of the woodstation and all the logs fall into the trailer. Because this is a tilting operation you are not lifting the full weight of the logs. Beats handballing them out of the woodstation, or worse picking up from the floor! Photo to follow of tipping operation. This entry was posted in Appropriate technology, Green woodwork and tagged buckingham, logging, sawing horse, woodstation by Flying Shavings. Bookmark the permalink. Do you split the logs and then put them in the log cage? Or put them in log cage first? Could you post a series of pics showing the production process from felled tree to split log? The logs are first split either in two or four while still full length. The splitter will take 4 foot lengths (or something else in metric) and has an extra wide wedge so that even though it only has the normal amount of downwards travel, the arrangement allows a long log to be set on end at floor level and it splits easily, almost always the full length. These are thinnings mind, so the max diameter is about 12 inches. Just tried Sycamore and Beech so far, felled last Winter and no probs so far. The split logs are then loaded into the woodstation and cut through and through with the chainsaw. There is a loose holding clamp that prevents the top logs rolling out as they are cut. I’m using a 15 inch bar on the saw and there is only one possibility of contact with the back bar, and that is fairly remote and easily avoided. An 18″ bar would give serious risks of sawing steel. The spring mounted cages at the ends are pretty nifty too. If the logs are a bit too long, the cages can be laid down without detaching them, cut off the ends and then lift up the cages to hold in the rest of the logs as they’re cut.